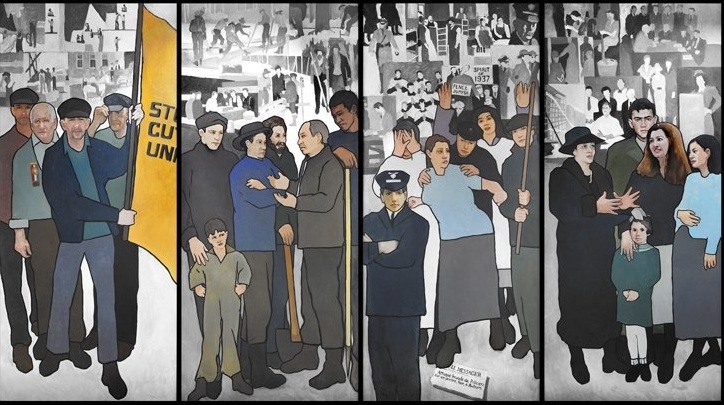 The appeal argues that Judge John Woodcock erred in his March decision that the labor mural was so-called "government speech" rather than the speech of the artist who created it. BOSTON — Critics of Gov. Paul LePage have filed an appeal in federal court in Boston to force the state to restore a labor history mural to the walls of the Maine Department of Labor. LePage ordered the 11-panel mural removed in March 2011 after receiving an anonymous complaint that it was pro-labor and biased against employers. The action triggered priotests and widespread criticism of the governor. Lawyers for the plaintiffs, Jeffrey Neil Young, Carol Garvan and Jonathan Beal, filed an appeal July 16 in the 1st Circuit Court of Appeals in Boston and released a statement about the action today. The appeal argues that the judge erred in March and that the mural represented the artists’ speech, not the government’s, and that the government cannot suppress a particular ideological outlook.